On Tuesday May 28 Collin Ferry from The Fetch Community Ambassador Team in San Francisco went along to the 13th annual SF MusicTech Summit. 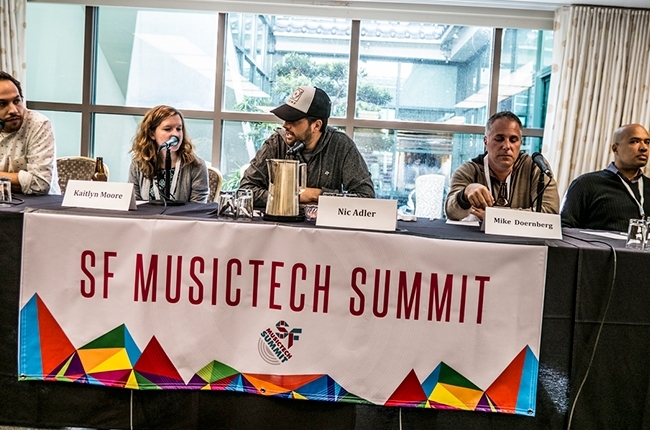 The SF MusicTech Summit boasts the goal of ‘bringing together visionaries in the evolving music/business/technology ecosystem’. 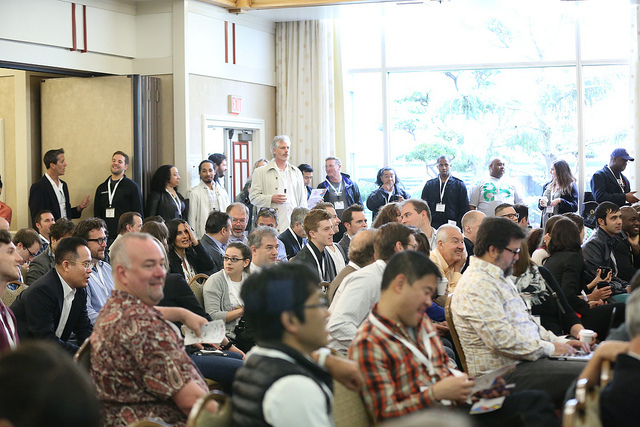 The day long event overtook Hotel Kabuki in Japantown, with hundreds of creative, coffee-fueled minds roaming from room to room sharing ideas, projects, and business cards. One common theme continued to reemerge from all the day’s dialogue: the vast importance of authenticity and transparency when engaging an audience. The following is a breakdown of the most interesting and worthwhile bits you may have missed. Despite his drive, he noted that they weren’t sure what stories were going to be told to get users to pay for music. An audience member noted that at present, “there are so many ways not to pay.” Ultimately, the idea is to provide users a good experience and then show them that by paying they could unlock a better one. Mason was adamant about the need for creatives to be receiving feedback directly from their fans. Without it, he said, “you’re just part of the product.” His sticking point was the need for companies to “stop building houses in other people’s backyards.” Despite handling a massive amount of internet traffic, BitTorrent is getting zero data out of Facebook, YouTube, or Spotify. They “don’t want to build another centralized system” that fails share data with artists. Instead, they want to build a new type of file that can be moved around the internet organically, with the option of gated content that will follow the file. Ken Jordan of The Crystal Method noted that releasing tracks for free online has long since replaced the single. Sahil Lavingia, Founder of Gumroad, described his service as creating the closest possible experience to buying content from the artist directly. Instead of an artist having to partner with or build a separate entity for sales, they can capitalize on pre-existing relationships and enjoy abnormally high conversion rates. Lavingia commented that, “as long as a sustainable business model exists behind Spotify,” they will continue to thrive. But, as he saw the numbers, it’s not there yet. On the other side of streaming, McDaniel commented that ownership of a download from Apple “is a myth.” What end users are buying is the right to play the media on an Apple device. Brian Zisk hosted this open dialogue session to brainstorm the future of the industry. “[Music] is a major part of our culture,” but, “if the system doesn’t work…it doesn’t work.” Audience members tossed around ideas. Was the answer to be transparent? Prolific? One audience member argued that most of music’s 50,000 year history has not been about recording at all. Ultimately, Zisk noted that this conversation was a, “short session tackling a long problem,” but encouraged companies to make a habit of thinking about the ecosystem at a macro level. Jack Conte demonstrated his new service Patreon, a platform for fans to become patrons of content creators. “Ad revenue is broken,” he said, and Patreon is one promising solution that allows individuals who are already making quality content to get paid for it. Matthew Smith showed off DeliRadio, an impressive service allowing users to listen to streaming radio stations based on upcoming shows at specific, local venues. By using DeliRadio, listeners can discover new music from bands that will be playing near them in the future. While there was general agreement that creating direct connections between artists and fans was the most important aspect of creating quality experiences, the industry is still working out the best ways to accomplish this. The panel’s moderator, Benji Rogers of PledgeMusic, asked the crowd how many people were a member of a band’s fan club. “Now there’s something to pay attention to,” be said when only two people raised their hands. The discussion turned to incentivized sharing. J Sider of BandPage complemented Sara Evans on a campaign that allowed fans to submit videos of themselves singing her songs for a chance to sing with her on stage. Now thousands of fans are putting video and email addresses into the system. On top of that, because the submissions are creative, most fans are then sharing their videos independently on social media. One interesting tidbit was the suggestion to track an artist’s (or anyone’s) Wikipedia page traffic as it remains one source of data that is a true indication of that entity’s popularity on the internet. Any spikes reveal true organic interest, not paid traffic. When discussing whether mediums like Facebook and Twitter are channels or dialogues, Mike Doemberg responded, “What we really want to say is ‘go buy our product. We’re important. We’re interesting. Listen to us.’ The truth is that isn’t really what the community wants. What it really wants is a dialogue. It wants us to hear them when they complain. It wants us to recognize them when they do something interesting. It wants us to represent them the way they want to be represented as a community. I think for us…when we start to push the envelope too hard on a business objective, [we] start to lose the community.” He went on to describe the need to constantly evolve and change course based on the way the community might be responding to different messages in the same way that one is constantly gauging reactions and adjusting behavior when interacting with family or friends. Will Henshall, Founder of Focus@Will, demonstrated his new product which he created as a result of his fascination with “why we do stuff when we listen to music.” Most commercial music is distracting, “15% more distracting, actually…we found out that your subconscious mind is explicitly sensitive to different orders of playlisting of different pieces of music.” Focus@Will has around 80,000 pieces of music that are algorithmically placed in an order that will encourage maximum focus and attention span. About our Ambassador // When not reporting for The Fetch, Collin Ferry is carving a path for Ergo Depot, San Francisco’s first and only ergonomic furniture studio. He recently co-piloted a road tour for IdeaMensch and has otherwise traveled all over the planet. Follow him on Twitter at @collinferry.